A bunch of things have been happening -- new plants, sightings of interesting and/or pretty things, discoveries of articles on the internet that you may find relevant or important -- but I've been unable to write during the last few days because 1) all the plants had to come back in the house for a few days, and then 2) in the process of bringing all the plants back in the house for a few days, I exhausted myself, to the point where I was questioning whether or not I might actually be sick. All available evidence suggests that no, I was not sick, only tired, but it doesn't really help at all to think that there's probably no actual virus or whatever involved. 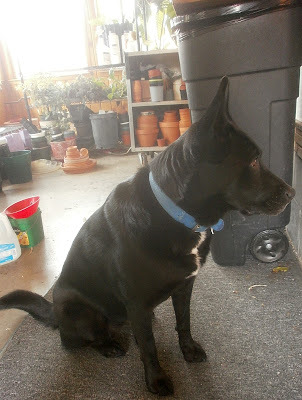 Sheba in the plant room, before everything came back in. It's always that messy, but usually you can't see the mess because there are plants there to hide it. So anyway. I'm debating whether or not to put the plants back out again immediately once the weather warms back up. Since they're already semi-acclimated to the light level out there, it seems like a waste of the effort I've already put in not to move them back out immediately. On the other hand, the nights aren't going to be warm enough to leave them out for a while, so if I put them out, I'll have to move them twice a day until it is warm enough. Which isn't very appealing at the moment. So it looks like I'll have to procrastinate on making the decision. Starting tonight, it's going to turn cold again, so all the plants that I've been carefully moving around every hour so they don't sunburn are going to have to come back inside and live in their old spots again for four or five days. There are obviously worse things than having to move lots of plants around, but I can't remember what any of them are, because I'm exhausted from moving lots of plants around. About 75% of that last sentence isn't even a joke. Therefore, today's post will be a lazy and poorly-photographed assemblage of things I've seen when transporting the plants from place to place. 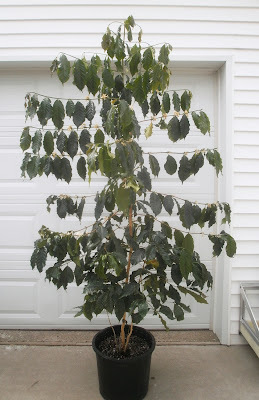 First up is the big Coffea, which is . . . big. This is an inaccurate picture in two ways. One, the top tier or two of branches got whacked by the ceiling fan or bent against the ceiling or otherwise broken, at some point a day or two after this picture was taken, so the plant is now slightly shorter than this. The second way the picture is inaccurate is because the plant is more or less upright. That's not unheard of, but it's not been typical lately. 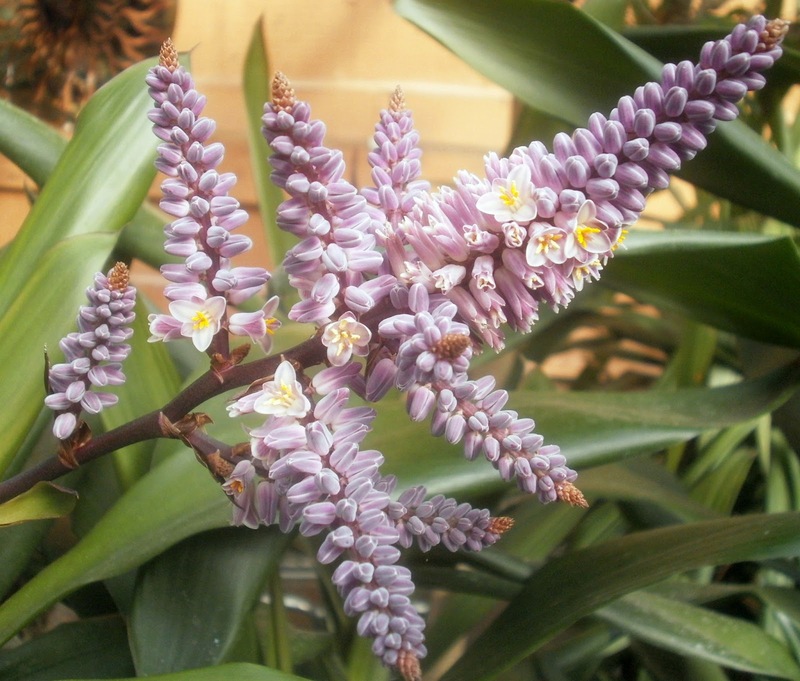 Because it's been grown indoors for so long, the stem is weak, and any little breeze will tip it over 60 degrees. For the moment, the precarious-looking wobble is sort of serving a purpose. 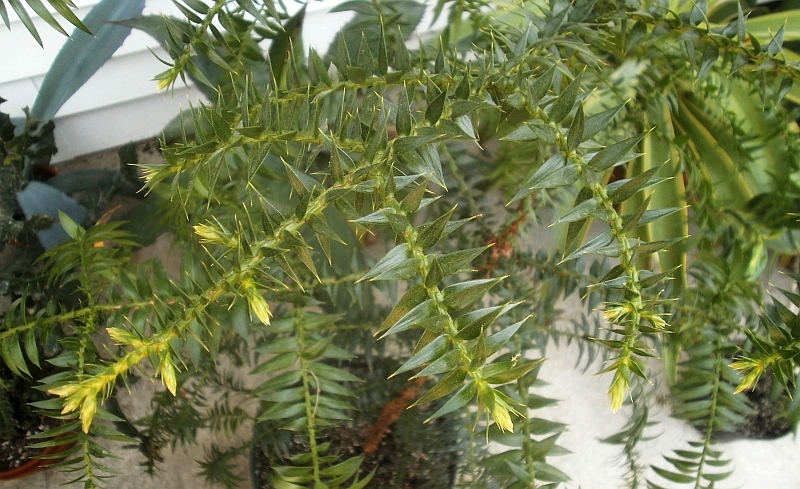 I don't have any good spots for keeping a plant this tall in total shade, but it's always waving around, so none of the leaves wind up staying in direct sun long enough to burn. That, or Coffeas are just naturally sunburn-resistant, 'cause it's been fine. I prefer to think that it's the waving around, not natural sunburn resistance, because then that means the waving and bending is a good thing. In any case, I'm hoping that the plant takes this as a sign that it needs to invest in a thicker, sturdier trunk before the summer's over. 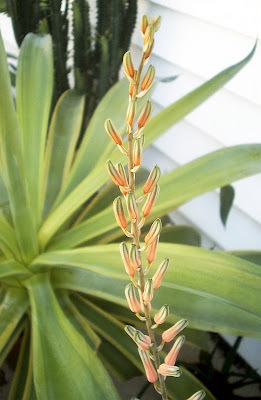 Next up, the Aloe harlana, or whatever it is, had started to produce some flower buds before it got moved outside, but they're getting bigger and starting to color up now. The above picture was taken on Monday; by Tuesday morning, when I got the plant out of the garage, the inflorescence was nearly horizontal. It didn't seem to be creased or broken, so the flowers might still open, but I don't have an explanation for the sudden change, so I'm a little concerned. If the flowers open regardless, I'll be pleased. If they open and I get to see a hummingbird, I'll be more pleased, but so far since we moved, I've gotten an average of one hummingbird sighting per year, and I'd just as soon not use mine up so early and then have nothing to look forward to. Next. Have I told you lately how much I love my Araucaria bidwillii? 'Cause I do. It's been around long enough now that I'm actually starting to think of it as a friend. Even by normal plant-personification standards (or, you know, "normal" plant-personification standards), that's a bit much. I guess it's true, what Bob Dylan said: the plants are my friends; they're blowing in the wind. Puns aside, the A. bidwillii is putting on a bunch of new growth all of a sudden. Some combination, no doubt, of the longer days, brighter light, better air circulation, and increased root room -- I repotted it on 11 April. Not all of the news is good. The goddamned fungus on the Euphorbias is not getting any better, despite pretty liberal application of chlorothalonil, and I'm alternating between rage and despair about that whole situation. (I suppose it's probably too early to give up just yet, though.) Also I was throwing the tennis ball for Sheba on Monday and mis-aimed it into the plants. Blew some leaves off of the big Agave victoriae-reginae, as well as partly pulping some of the weaker Aloes, which was a bummer. But these things will happen. And I've learned some sort of valuable lesson, I'm almost certain. 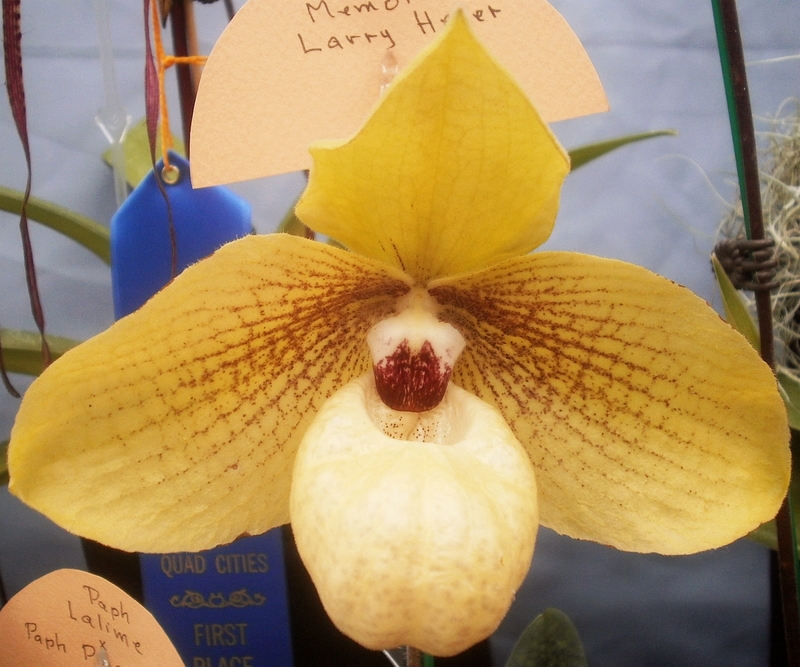 Paphiopedilum Memoria Larry Heuer is a cross between Paphiopedilum malipoense (previously) and Paphiopedilum emersonii. I don't think I have any particularly strong feelings about it one way or the other. So I still have no idea what Cordyline glauca's origin might be. I suppose we're lucky that no lives are at stake. Fortunately, we don't need to know its origin in order to appreciate its flowers. 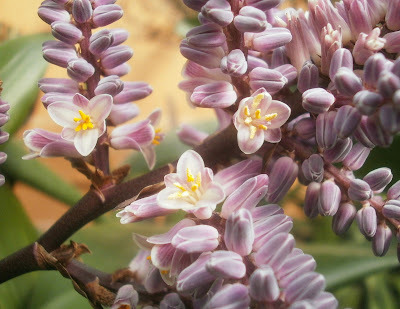 I've posted pictures of C. glauca flowers previously, but 1) the older photos were produced under the lower-light conditions of the ex-job's greenhouse, and the inflorescence was consequently a bit stretched-out looking, 2) these are better pictures than those in the other post, and 3) the flowers are almost exactly the same color as the current blog background, and one doesn't often get opportunities to be so matchy-matchy on the blog. 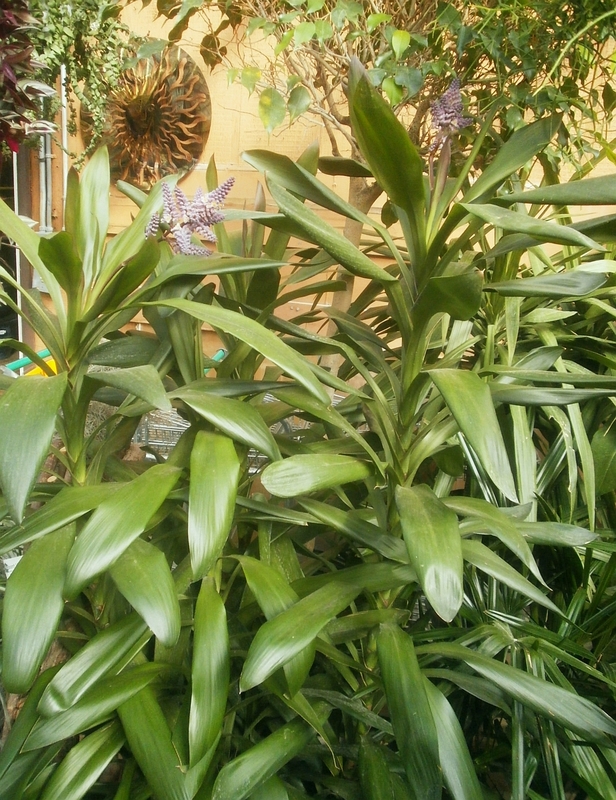 I've only tried Cordyline glauca indoors once; I don't recall it ever having any pests, but it also didn't grow very much. It sort of limped along for a few years, then died. Cause of death was undetermined, but I suspect at least some of the problem was that it wasn't in strong enough light. I didn't try to replace it because the specimens available around here are usually pretty big (~3-5 feet / 1-1.5 m tall) and expensive (~$30-40). Flowering is, of course, unlikely indoors, though probably not impossible. Unrelated but still interesting: having scale infestations suddenly seems . . . not so bad.